It was a tough group with Tom Phipps, local boy Curtis Tomlinson and Jonathan Maloney all probably feeling that they had a chance for the title. Only one could make it through though and Phipps was taking no prisoners, making it through one of the toughest groups we have had without dropping a single game. It was the final that the local boys wanted to see with Local Hero Goodings taking on 2011 Series Champion Phipps, unfortunately in the end it was a bit of an anti climax. Some days Goodings is on but this wasn't one of them! "A games worth of tins" according to Dave Heron was the difference between them. Phipps has now taken 3 titles in a row and will definitely be one to watch for the nationals. Last years champion Matilda Parslow made a great start to her 2012 campaign winning both group matches without dropping a set. Jo Moseley had to much for Kate Ibbitson and finished 2nd. Samantha Muller was to strong for both Elaine Gilchrist and Audrey Coulson, using a variety of shots and moving onto every ball with speed and purpose. She took the group without dropping a set but the single game dropped by Coulson against Gilchrist was enough to see her fail to make it through to the winners group at the half way point. In complete reversal of the mornings fortunes Kate Ibbitson went straight through in her last couple of matches of the day winning the group and taking the maximum 4 points. Coulson showed her fighting spirit taking her revenge on Gilchrist to claim 5th place. It was a great match between Parslow and Moseley, both fought right to the end with Parslow looking to keep the pace on the ball and move it quickly into all four corners. Despite a good start however Mosley managed to peg her back in the 2nd and then inch ahead in the 3rd. 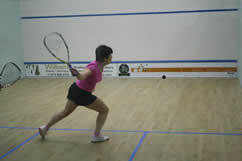 In the end it was a tie break that decide 2nd place in the ladies draw with Mosley taking the match 13/11 in the 3rd. Despite both fighting hard against Mueller in the end she was to fast and accurate and finished the event without dropping a set. No. 1 seed Ian Furlonger made it through to the semi without dropping a set. Marc Thornley was to strong for Nigel Stone in group B, with consistent hitting he saw the seed off 2-0 to earn his first series points of the new season. It was a tough fight between Paul Whitby and Darren Withey to decide the largest group in the over 40's but in the end Withey's pace was enough to see him through, but he has had one more match than the others which might make it tough to make it all the way. With speed and variation Jason Russell saw off first Mark Webster and then Robert Hambrook to claim the final slot in the semi finals. It was a great battle between Thornley and Furlonger, both players brought there A game along and were going for all there shots. Despite some great drops and cross court nicks from Furlonger the pace of Thornley was no to be denied earning him a place in the final 2-0. It was another great semi in the other half with Witney fighting Russell all the way to a deciding game. in the end the extra game in the morning might have taken it's toll, but Russell is looking very quick and accurate. After two tough semi's the final was always going to be tough for both competitors and was going to be a battle of recovery as much as Racketball. Russell looked strong throughout the day and would not be denied the title, he mixed the pace well, attacked at the right times and looked very comfortable on the ball. The over 40's seems to be growing in strength each event and it's great to see some real rivalries starting to develop. It was a good start for "series favourite" Murphy who defeated both Les Litwin and Andy Mitchell 2-0. He came unstuck against Malcolm Bramley however who made it tough right to the end and eventually wore Murphy down in one of the longest 2-0's of the day. 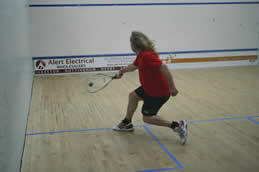 Graham Greensall was solid in group B making it through without dropping a single set. The other results all lived up to there seeding with Ian Couldon coming in 2nd and Bill Smith taking 3rd place. Gabriel Uttley continued 2012 where he left off in 2011 on a great run of form winning all his group matches but Graeme Slocombe took him close. Local 50's Champion Millington came through strong in group D. It was a tough fight for Seddon to overcome Gilchrist. Uttley was strutting with an injury all day and despite bravely pushing through was unable to get any change out of his opponents. Malcolm Bramley continued where he left off in the groups coming through against Greensall 2-0. Millington on home turf was motivated and impressive and managed to overcome Uttley 2-0. In the final Bramley fought Millington hard but didn't have enough to prevent him taking home another title, Millington will be another to watch at the Nationals at the start of May. It was one big group in the beginners with all matches best of 5 to 11. Claire Bullock was unfortunate to finish 4th after taking games off both John Noakes and Jamie Hissitt. Dariusz Wantanowski was not to be denied and came through without dropping a set. When Dariusz first started on the UK-Racketall Series he was a complete beginner, his range of shots and consistency have improved considerably and it might now be time to make the step up to the B, great progression. Neil Paisley was fortunate to make it through the group after losing to Stephen Elliot but the result out of his hands went his way with Leigh Brushy defeating Elliot without dropping a set. Series favourite David Heron fought group winner Lee Brownson all the way and in the end missed out on making it through by only a single point. Nick Bond made it through without dropping a set which will improve his unflattering National Ranking of 144. Despite only just making it through the first group stage Neil Paisley overcame both other group winners to take the B crown. Bond and Brownson finished on equal points but with Brownson the fortunate victor in the head to head he came through to take the B grade 2nd place trophy prize and ranking points. 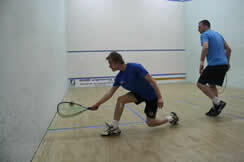 It was another big entry to a UK-Racketball Series event and a great start to the 2012 Series. 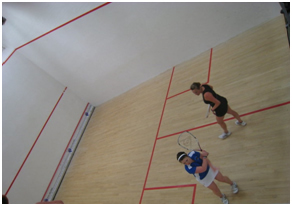 The Manor is one of the biggest racketball centres in the country. At the time of last year’s event the Manor Racketball Open 2011 broke the record for the number of entries into a UK-Racketball Series event with over 70 competitors on the day. The event also saw one of the strongest entries into the beginners and ladies categories which were won by John Brierley and Matilda Parslow respectively. The Manor is currently going through a revival with a new management and coaching team lead by Pete Goodings. In 2011 the club saw its membership increase dramatically and with reinvestment projects already underway the club looks set to become one of the best racket centres in the Midlands. To demonstrate our support for the Goodings programme, Star Sports are also hosting a Fantasy Squash event at The Manor in 2012. The Manor is located in the racketball hotspot of Derbyshire this is bound to be one of the best attended events in 2012 and with all courts being devoted to the Manor Racketball Open the UK-Racketball Series really will take over the club for the day. With the tournament scheduled for just before The National Championships it is bound to be a full day of racketball action! The Manor has plenty of onsite parking available, a great gym where players will be able to warm up and a sauna for after your match. Hot and cold food will be available throughout the day from reception and the bar. The club is easily accessible just off the M1.